“In art, as in love, instinct is enough,” says Jazz Chong on the topic of her second greatest passion (the first being music). Having established Ode to Art in 2004, it was undoubtedly a different ball game eight years ago, and the local art market has matured and diversified to encompass a wider variety of art forms and styles. “Since the opening of Ode To Art, I have discovered the preferences of both local and international art collectors are diversifying from just paintings and sculptures, to more unconventional mediums and forms such as installations,” says Chong. Ode to Art currently has two spaces in Singapore and one in Kuala Lumpur, Malaysia. For her, the artist selection process is approached with various factors in mind – firstly, understanding the artist's journey and body of work, as well as the story and sentiment behind the pieces. After all, art is all about making an emotional connection. "The character of the artist also plays a big part in determining whether we can work together or not," shares Chong. We chat more with the passionate art lover about her gallery, and being a bridge between artists and collectors. Asia Tatler: What compelled you to start your own art gallery? 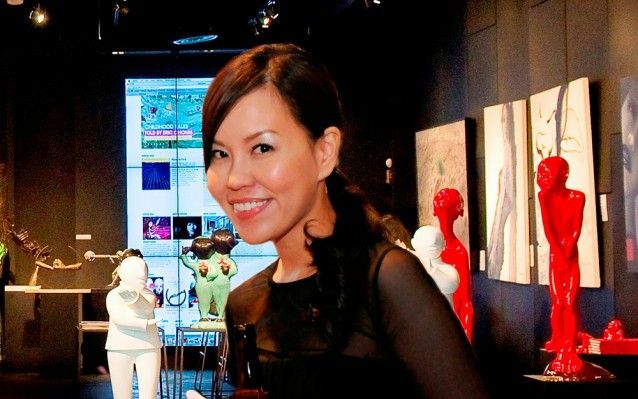 Jazz Chong: Art was the second love of my life following music, thus I decided to follow my intuition to share my passion for art with collectors who appreciate aesthetics as much as I do. AT: What can visitors expect to find at Ode to Art? JC: Our direction is to represent international emerging and established contemporary artists. All three galleries carry a diverse variety of local, regional and international artworks with styles ranging from contemporary pop art to figurative. We have regular art exhibitions where international artists will be in the gallery. The process is for collectors to interact with artists and educational process. AT: Tell us more about some of the artists you’ve brought in. JC: We have brought in prominent artists like Chen Wenling, whom we have represented for the last six years. He is right now considered one of the top 10 contemporary sculptors in China, with many international exhibitions. We also recently had a solo exhibition of Korean artist, Lee Jung Woong, the “Brush” artist, who has shown extraordinary talent through his hyper-realistic paintings. Also, South American artist Jiminez Deredia, who is the first contemporary artist to have exhibited at the Colosseum in Rome. More recently, we brought in Korean artists Ran Hwang, who creates wall installations with unique materials such as pins and buttons; as well as Park Seung Mo, who uses multiple layers of metal and wire to form images of faces which are only clearly visible when viewed from a distance. The works of these two artists have been very well-received and have attracted lots of attention from visitors. AT: How much of your own personality and passions do you channel into the gallery? JC: My galleries all share a common trait of exuberance and novelty – there is always an influx of new artworks, and the galleries’ displays are never stagnant. To be in love with a work of art, it is also important to know the artist. Therefore, I often try my best to fly the artists themselves in so that collectors will have the opportunity to meet and connect with them personally. I enjoy establishing deep friendships with people, and this applies to both collectors of the gallery as well as the artists. Instead of thinking of my galleries as mere shops, I like to think of them as a platform for people to meet and share their love and passion for art. AT: What type of art do you personally love? What kind of pieces would one find in your home? JC: There is no particular type of art which I like; I am very open to different genres, including paintings, photographs, and sculptures, from both Asian and Western artists. There are a few artists whose works are represented by the gallery and also found in my home. For example, Chua Ek Kay’s paintings, as I have a personal relationship with him and collect quite a bit of his art. I also house the works of Chinese artists Chen Wenling, Li Ji Kai, Ai Weiwei and Taiwanese sculptor Li Chen. As for photography, [I’ve collected works from] Cui Xiuwen and Huang Yan. In addition, I collect Damien Hirst’s and Andy Warhol’s works. Ode to Art is at Raffles City, #01-36E/F, Tel: 6250 1901, and The Shoppes at Marina Bay Sands, #01-19, Tel: 6688 7779.